Today is the 2nd to last day of my 12 days of giveaways! 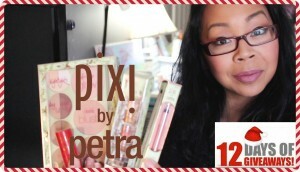 #mtbcHoliday Today I will be giving away Pixi Beauty products from their Holiday Collection! Stay tuned for a special giveaway for my last day tomorrow! Enter today’s giveaway on the link below and on my Instagram pic! Enter below through Rafflecopter or click here. 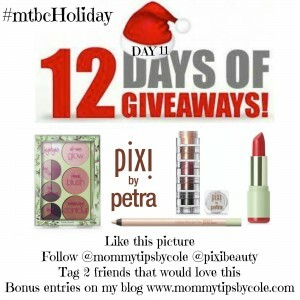 15 Responses to "PIXI BEAUTY HOLIDAY COLLECTION & GIVEAWAY | 12 DAYS OF GIVEAWAYS: Day 11 | #mtbcHoliday"
Thanks for this giveaway! :) I’d love to try pixie makeup! These look awesome. Thank you. Super amazing giveaway,so gorgeous, I would love to win this make up kit because I’m looking to create a flawless natural look,will allow me also to experiment new brands and play with colors,thank you so much for sharing the love giveaway opportunity and wish you all the best and more shower of blessings to your wonderful channel, Happy Holidays,good luck everyone. I would love to win this! Love your giveaways and blogs!